Acura has never been more American than it is now. 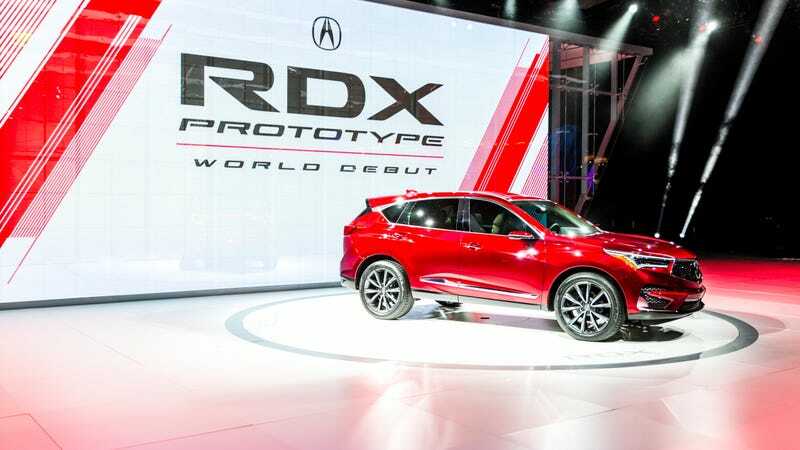 After three straight years of selling more than 50,000 RDXs here, we’re getting the first one designed and developed in the States in the form of the 2019 Acura RDX. Acura jumped on the baby CUV bandwagon relatively early with the RDX in 2012. While it got a face lift in 2016, the car has remained essentially unchanged since it rolled out. Since then the crossover has been the company’s bread and butter. But the crossover field has become many more players now, and it’s tougher to stand out in the crowd. The last generation RDX was predictably boring and devoid of personality. Acura hopes a sharper design language will pull buyers back to the RDX. This is being called the RDX Prototype, but in Honda parlance that means a concept that’s like 99 percent close to reality. The design harkens back to the Acura Precision Concept, which Acura displayed in Detroit in 2016 in sedan form. That means sharper lines and creases with a more aggressive nose. The grille is pretty, like a starburst pattern coming from a huge Acura badge. This new RDX platform is exclusive to Acura, so hands-off Honda. The interior is completely updated, with a large touchscreen (of course) and controls below. The chassis is now stiffer, there’s new multilink rear suspension, four drive modes and some sport seats that Acura really seems to love. The RDX gets a 2.0-liter four cylinder direct-injection turbo, good for 40 percent more torque than RDXs past, running through a 10-speed automatic with Super Handling All-Wheel Drive. Exact power figures haven’t been listed yet. There will be a V6 turbo, apparently, but we don’t yet have details for that one. If a Japanese car could be more American in its philosophy, aims, or attitude, it would be all-chrome and have a hamburger dispenser. This big-badge crossover is exactly and absolutely what we want, at least if our buying trends are anything to go by. Our shooter Kurt Bradley got live shots of the thing. And here are Acura’s own press pics.